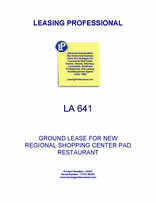 This lease is for a new high end restaurant to be located on a regional shopping center pad ground leased by the tenant. The tenant is to receive a construction allowance, pay percentage rentals, and receive a term on the ground lease lengthy enough to amortize the expensive improvements involved. The restaurant will also serve alcoholic beverages. 2.1 Landlord leases the Demised Premises to Tenant upon the terms and conditions set forth in this Lease. 3.1 Except to the extent modified by Landlord's express assumption of construction obligations in Exhibit "C" attached to this Lease, and except as provided in the last sentence of this Section 3.1, the Demised Premises is being leased "AS IS," with Tenant accepting all defects, if any; and Landlord makes no warranty of any kind, express or implied, with respect to the Demised Premises (without limitation, Landlord makes no warranty as to the habitability, fitness or suitability of the Demised Premises for a particular purpose nor as to the absence of any toxic or otherwise hazardous substances). This Section 3.1 is subject to any contrary requirements under applicable law; however, in this regard Tenant acknowledges that it has been given the opportunity to inspect the Demised Premises and to have qualified experts inspect the Demised Premises prior to the execution of this Lease. To Landlord's current actual knowledge, there has been no storage or disposal of any toxic or hazardous substances at the Demised Premises during Landlord's ownership of the Demised Premises. (a) Tenant shall construct or cause to be constructed, at Tenant's sole cost and expense (except as otherwise provided in Exhibit "C-1" attached hereto), the Building, together with the parking areas, driveways, sidewalks and other improvements to be located upon the Demised Premises (the "Improvements"), in accordance with the final detailed plans and specifications ("Plans and Specifications") and the detailed site plan ("Site Plan") each to be prepared forthwith by Tenant and delivered to Landlord for Landlord's approval. Tenant covenants to deliver the Plans and Specifications and the Site Plan to Landlord for approval prior to _______________. Approval by Landlord shall not be unreasonably withheld, provided that the Plans and Specifications and Site Plan: (i) relate to a "______________ restaurant"; (ii) are consistent with the preliminary site plan attached as Exhibit "B" to this Lease, as well as with prototype drawings delivered to Landlord by Tenant; (iii) provide for a building height no greater than ____________ feet above finished grade; and (iv) provide for a building "footprint" (i.e., ground area) of no larger than ______________ square feet. Landlord shall promptly approve or specify in detail any deficiencies in the proposed Plans and Specifications and Site Plan; and in the event of Landlord's disapproval, Tenant shall in good faith attempt to remedy all deficiencies reasonably specified by Landlord. If Landlord fails to specify its objections in detail by written notice delivered to Tenant within ten (10) business days after the date of Tenant's delivery to Landlord of the proposed Plans and Specifications and Site Plan, Landlord's approval shall be deemed to have been given. Upon approval by Landlord, two or more sets of the final approved Plans and Specifications and Site Plan shall be signed by both parties and shall be deemed incorporated into this Lease. (b) Landlord and Tenant acknowledge that the preliminary site plan attached as Exhibit "B" to this Lease provides for _____ parking spaces, which is approximately 10 spaces short of code requirements for the City of __________________ ("City"). Tenant represents that any changes made to the Site Plan will not reduce the number of parking spaces below ____. In that regard, Landlord will attempt to obtain an agreement from the City allowing the Demised Premises to have fewer parking spaces than would otherwise be required by the applicable city code. If Landlord is successful in procuring the City's approval in the reduction of the required amount of parking spaces, Tenant agrees to accept the Demised Premises with such fewer parking spaces. Tenant agrees to cooperate with Landlord in Landlord's attempt to obtain this agreement with the City. If Landlord is unsuccessful in obtaining such an agreement from the City, Landlord agrees to provide up to an additional _______ parking spaces to Tenant by either (i) providing a non-exclusive easement to use such additional spaces located in the Shopping Center Common Areas adjacent to the Demised Premises and entering into the written agreement allowing Tenant to "count" ten (10) of the Shopping Center's spaces towards Tenant's parking requirements as provided in Section 2.02(a) of the OEA (as defined in Section 7.3 hereof) or (ii) reconfiguring the Demised Premises, in Landlord's reasonable discretion, to provide such additional spaces. In either event, Landlord and Tenant will cooperate with each other in order to provide to Tenant the required parking to meet the City's parking requirements. (c) All architects, engineers, the general contractor and others to be employed in connection with the construction shall be selected by Tenant; provided, however, that Landlord's written approval of all engineers, architects, and contractors (which shall not be unreasonably withheld) must be obtained. Landlord agrees to provide such written approval or disapproval of Tenant's architects, engineers, or contractors within five (5) days after receiving Tenant's request for such approval. The supervising architect shall be a member in good standing of the American Institute of Architects or of another organization having comparable accreditation and the general contractor's financial condition and responsibility shall be such as to enable Tenant to obtain a payment bond and performance bond. (d) Promptly after the signing of the Plans and Specifications and Site Plan by both parties, Tenant shall request bids from general contractors for the purpose of constructing the Improvements in accordance with such Plans and Specifications and Site Plan. Upon receipt of bids, Tenant shall approve a general contractor from the bidders, and Tenant shall execute a construction contract with such contractor upon terms satisfactory to Tenant for construction of such Improvements on the Premises; provided, however, that as part of the construction contract, Tenant must require that the general contractor waive and relinquish any and all mechanics lien claims which it might have against the fee simple title and Landlord's interest in the Demised Premises as the result of the construction of Improvements. So long as the general contractor (i) is a member in good standing with the Association of General Contractors, (ii) qualifies to obtain statutory payment bonds, and (iii) is otherwise acceptable to Landlord in its reasonable discretion, then such general contractor shall not be required to obtain a statutory payment bond in connection with the Improvements; otherwise, such general contractor must obtain such a bond. Tenant agrees to provide to Landlord upon request such information as Landlord may reasonably require with respect to the general contractor. (e) Tenant's construction work shall commence no later than five (5) days after the last to occur of the following: (i) the date upon which Landlord has obtained a platting designation for the Demised Premises from the City of __________________, __________________; (ii) the date upon which Tenant has obtained a building permit; (iii) the date of final approval by Landlord of the Plans and Specifications and the Site Plan; or (iv) the date of substantial completion of Landlord's Work (as defined in Exhibit "C"). Tenant agrees to submit any required applications for its building permit to the City of __________________, __________________ on or before ______________, and to use its best efforts to obtain such building permit. Tenant shall also use commercially reasonable efforts to complete the contribution of its building within 180 days after commencement of construction. (f) Landlord and Tenant agree that although Landlord will be the owner of the Demised Premises (as well as reversion rights to the Improvements after the conclusion of this Lease), Tenant shall nevertheless be responsible for: (i) the payment or other release of all claims by contractors and subcontractors; and (ii) all maintenance, repair and replacements during the term of this Lease. (g) Tenant shall retain, during the term of this Lease, the original counterparts of all warranties and guaranties pertaining to Improvements and equipment erected or installed upon the Demised Premises; however, on the Rent Commencement Date, Tenant shall deliver to Landlord copies of all such warranties and guaranties. In the event of termination of this Lease when any warranties or guaranties are still applicable, Tenant hereby assigns to Landlord effective as of the date of termination all such warranties and guaranties pertaining to the Improvements (including, without limitation, all heating and air conditioning equipment installed within the Improvements). 4.1 Rental shall accrue from the Rent Commencement Date, and shall be payable to Landlord, at Landlord's address. 4.2 Tenant shall pay to Landlord minimum guaranteed rental in monthly installments in the amount(s) specified in Section 1.1(l) of this Lease. The first such monthly installment shall be due and payable on or before the Rent Commencement Date, and subsequent installments shall be due and payable on or before the first day of each succeeding calendar month during the Lease Term; provided that if the Rent Commencement Date is a date other than the first day of a calendar month, there shall be due and payable on or before such date as minimum guaranteed rental for the balance of such calendar month a sum equal to that proportion of the rent specified for the first full calendar month as herein provided, which the number of days from the Rent Commencement date to the end of the calendar month during which the Rent Commencement Date shall fall bears to the total number of days in such month. 4.5 The term "Gross Sales", as used in Section 5.1 below and elsewhere in this Lease, shall be construed to include the entire amount of the sales price, whether for cash or otherwise (including the full purchase price of purchases in whole or in part by means of gift certificates, advertising certificates or trade-ins), of all sales of merchandise and services, and other receipts whatsoever, of all business conducted in or from the Demised Premises, including, by way of illustration (but in no way limited to), mail or telephone orders received or filled at the Demised Premises, "layaways" and other deposits (offset by such sums refunded to purchasers), orders taken (although such orders may be filled elsewhere), sales to employees, sales through vending machines, electronic games or other devices, and sales by any sublessee, concessionaire or licensee or otherwise (as well as licensee fees, franchise fees and similar fees) in or from the Demised Premises. Each sale upon installment or credit shall be treated as a sale for the full price in the month during which the sale was made, irrespective of the time when Tenant receives payment from its customer. 4.6 It is understood that the minimum guaranteed rental is payable on or before the first day of each calendar month (in accordance with Section 4.2 above) without offset or deduction of any nature. In the event any rental is not received within 10 days after its due date for any reason whatsoever, or if any rental payment is by check which is returned for insufficient funds, then in addition to the past due amount Tenant shall pay to Landlord one of the following (the choice to be at the sole option of the Landlord unless one of the choices is improper under applicable law, in which event the other alternative will automatically be deemed to have been selected): (a) a late charge in an amount equal to five percent (5%) of the rental then due, in order to compensate Landlord for its administrative and other overhead expenses; or (b) interest on the rental then due at the maximum contractual rate which could legally be charged in the event of a loan of such rental to Tenant (but in no event to exceed 11/2% per month), such interest to accrue continuously on any unpaid balance due to Landlord by Tenant during the period commencing with the rental due date and terminating with the date on which Tenant makes full payment of all amounts owing to Landlord at the time of said payment. Any such late charge or interest payment shall be payable as additional rental under this Lease and shall be payable immediately on demand. If any rental is paid by a check which is returned for insufficient funds, Tenant shall immediately make the required payment to Landlord in good funds; moreover, Tenant shall also pay to Landlord the amount specified above in this Section 4.6, plus an additional fee of $50.00 to compensate Landlord for its expense and effort in connection with the dishonored check. 4.7 If Tenant fails in two consecutive months to make rental payments within ten days after due, Landlord, in order to reduce its administrative costs, may require, by giving written notice to Tenant (and in addition to any late charge or interest accruing pursuant to Section 4.6 above, as well as any other rights and remedies accruing pursuant to Article 22 or Article 23 below, or any other provision of this Lease or at law), that all future rental payments are to be made on or before the due date by cash, cashier's check or money order and that the delivery of Tenant's personal or corporate check will no longer constitute a payment of rental as provided in this Lease. Any acceptance of a monthly rental payment or of a personal or corporate check thereafter by Landlord shall not construed as a subsequent waiver of said rights. 4.8 All amounts required to be paid by Tenant to Landlord under this Lease will be deemed to constitute additional rental for all purposes and, unless specifically provided otherwise, Tenant must pay such amounts owing within ten (10) days after Tenant's receipt of an invoice from Landlord.